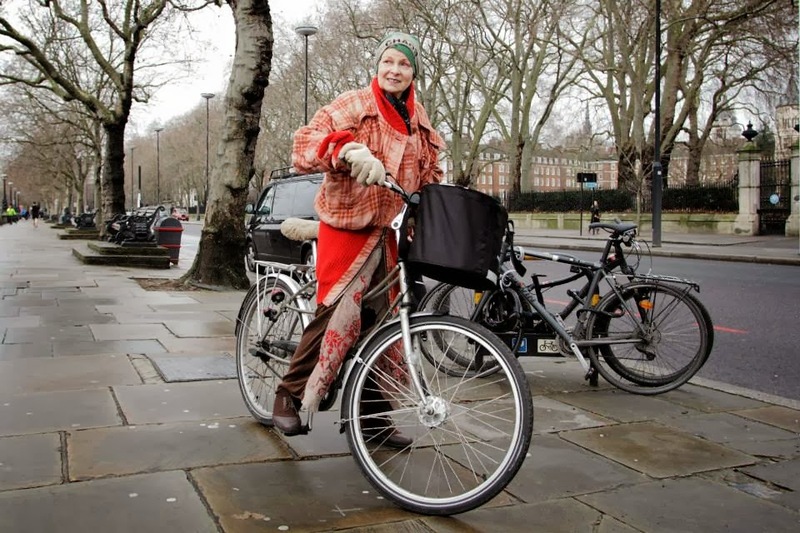 This blog took longer than usual to post as I got caught up in the heady swirl of the Press Conference for End Ecocide in Europe with the zany, colourful and environmentally astute Dame Vivienne Westwood. However, by Sunday we still did not have a London venue and the Press had not yet been informed. Bloody hell. I stopped resting on my laurels and swung into action. Once again, darling Chris Cooper on HMS President made everything click into place. We then had a venue in the centre of London (Plus it is much more glamorous now than when Roger had a photographic exhibition there in 2007.) Also it turned out that Vivienne Westwood had her perfume launch there, so that made it even more convenient - she knew the venue. She rode up on her bicycle. So cool. The resulting press coverage has been great – 2 impressive pieces in the Guardian today (one by Charles Eisenstein, one by Fiona Harvey) I wrote an article for ecology magazine; (AFP) Agence France Press has placed pieces around the world, including China. (Thank you lovely Alice Ritchie) and even the scandal rag, the Express came up trumps with a large headline ‘Vivienne Westwood backing proposed European environment law’. Astonishing. Vivienne Westwood was impressive, on every front. She came to the Press Conference armed with a map of the world depicting likely damage from global warming if the population of the world does not change its habits. At a glance, half the world would be uninhabitable. Thank god there are people like Vivienne Westwood around, not just prepared to take civic responsibility but prepared to educate others to realise we need to change before the damage is irreversible. Likewise, Prisca Merz, the End Ecocide Director, based in London – has worked around-the-clock and she has a full-time responsible job. Impressive. So, sorry guys, if this all seems a bit worthy, but I really wanted to get those 1 million signatures (just as well I am not a poker player.) In fact I am still astonished that people have not voted in their millions. If ecocide became a crime in law, that would protect the Arctic against negligent drilling, bees against decimating poisons, fish against industrial waste being carelessly released into the rivers and oceans, communities being threatened and displaced so that their forests could be turned into palm oil cultivation. I could go on and on. So why are people being so pissy about it? Why are they not signing? I won’t be doing another editorial on this subject, so do me a favour and leave a comment enlightening me as to why people have such reticence re trying to put some moral backbone into big business? What’s the problem? Meanwhile I have only one word: sign, sign, sign. Crumbling grandeur in San Telmo, Buenos Aires. High and very nearly dry river boat. New mural in old Fray Bentos factory. Rio Uruguay decaying wharf where 1500 cattle were slaughtered by hand and per day. - the beached and derelict but huge river boat 'Ciudad de Parana' stranded in a river bed miles from any main waterway. - two-foot long lizards and strange guinea pig like creatures that sat up and begged around our cooking fire. And red crested birds that showed no fear. - perfect roads that suddenly became pot-holed and crevassed and ripped through our steering rods, bursting tyres and stranding us miles from nowhere. No phone or internet signal either. - the estancia manager who came to our rescue, his six farm hands and the world’s most ancient tractor that towed us to his shady yard. His very real working gauchos who wakened us at 4.00 am with a thousand cattle drive and the pony-tailed hombre who drove 500kms through the night to fix the van and have us back on a rutted track by breakfast time. - the bigger than Wales wetlands with lakes and floating islands and the world’s largest rodents at 62 kilos and red-eyed crocodile thingies and shrieking birds, howling monkeys and insects rising to a crescendo at sunset. - mosquitoes as big as horses.And hot, hot, hot. - after being advised to keep the tank full - diesel stations being far between and few - so nearly running dry on a long sandy road to almost nowhere. - cooking dinner in a thunderstorm under a corrugated-roof shed with a view of Paraguay and tumbling over the apparent ruin of Hitler's majordomo Nazi Martin Borman's hideaway. - Jesuit ruins dating from 1580 built to 'protect' and convert Guarani native inhabitants to Christianity. (Well that's what the in-house movie said). - brown warm wide muddy rivers everywhere. We shared Christmas Eve with a few youths and a moto that had been re-tuned to mis-fire and sound like fire-crackers. By dawn the few had become a few hundred. Kids with pick-up trucks and Latino girl friends with heavy eyelids and contemptuous tango scowls. The boys drank lots, smiled more and our only communication was via the names of Argentinian footballers playing in Europe. We shook a lot of hands and at 06.30 we fled. - almost nothing in the shops (apart from red meat and lots of it) and Christmas lunch of canned tuna and canellini beans on a deserted riverbank. - we crossed into Uruguay at a border post that was pure cinema. Scruffy unshaven guards in ill- fitting sweat stained uniforms, loads of paperwork and huge rubber stamps. Scowls followed by handshakes and an illicit money changing operation in a back room. - armed with newly changed Pesos - and after stopping at yet another river bank - we arrived in Fray Bentos - the town that gave its name to corned beef. Literally. The Oxo cube was invented here and 1,500 cattle a day were slaughtered by hand (don't ask) before the stun gun was invented. Now the factory - opened in 1880 and closed in 1976 - stands forlorn and deserted. The dock on the Rio Uruguay is crumbling; great industrial machines cast in Glasgow stand proud in rusting decay alongside huge generators which produced electricity before they had it in Montevideo. This extraordinary sight, well off the tourist track, has been discovered by UNESCO and will become an iconic reminder of the industrial revolution. We got there before the buses and wonder for how long. - swimming in the Rio de la Plata and wondering how the River of Silver ever became the River Plate in English. 180 miles wide at the mouth and fresh water all the way. Icy beer and sand too hot for the bare foot. - the ghastly 26 storey Sheraton in Montevideo where we heard the first English spoken in a fortnight in an otherwise great town. London, Sydney, Cape Town, Bordeaux have turned redundant docks into restaurants, beeswax candle and tourist trinket shops. Not here. Cranes still swing and strain amidst quayside chaos. A gun turret from the Admiral Graff Spee scuttled after an estuary skirmish with the Royal Navy rests alongside a huge grey military building labelled Commandant de le Armada. We loved it all. - finally we returned, the long road way, to Buenos Aires stopping in Mercedes, Uruguay where families picnicked as if in 1950 in huge numbers, all shapes, sexes and sizes, all joyous and swam under a river bridge until well after dusk. We blew another tyre and the van got very tired. Once again the man came from BA and escorted us 'home' in time for New Years Eve. Another story.